Pink Lemon Twist: October Frost Back! 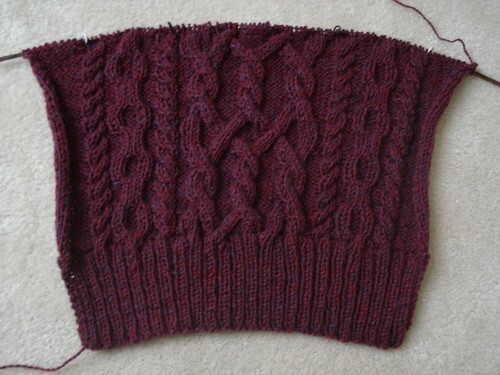 Yes, it's true, I've finished the fronts for October Frost! As you can see, I'm zipping through the back pretty quickly (more than halfway done, thank you very much) and I think I'll have this cardi finished fairly soon. It's really nice to be to the point where I'm not juggling two balls of yarn and two knitted pieces, I know, it's my choice to do both fronts at once and both sleeves at once, but otherwise I'd never get complete sweaters and I wouldn't have matching pieces. Of course, with me trying to get the back done soon, that means you might have to look at the back a couple of times this week, but maybe I can get Ramius to pose on it once. beautiful so far, can't wait to see it done! Did you buy *some* of us ponies? I'd like a chestnut brown one, please, with a black mane and tail. And a pink saddle. Thank you. It is crazy hard to think about anything using the word 'frost' in the current heat. BUuuut, I'm starting to covet that sweater. It's so gorgeous. Never mind the pony, I'd like the sweater. Please? What? No pony? But I really, really, REALLY want a pony. If robby doesn't want her pony, can I have it? I'll wait until Friday....& see my surprise.